Your Own Business… We’ll Set You Up Tomorrow. 10 VidioDek Customers Makes YOU $6888 Per Year. How Would You Like to SELL VidioDek & Keep 100% Profits? One last thing before you jump right into VidioDek. We've decided to LET YOU sell VidioDek and keep 100% profits for yourself. On this page only, you can get a RESELLER license to VidioDek. Which means you will keep 100% of what a customer pays when you refer them to our website. We’ve spent thousands of dollars in perfecting our software and making our marketing pages perfect and we’re letting you use the lot to make profits and keep it all for yourself. So jump on this offer before we up the price after 30 bargain sales. 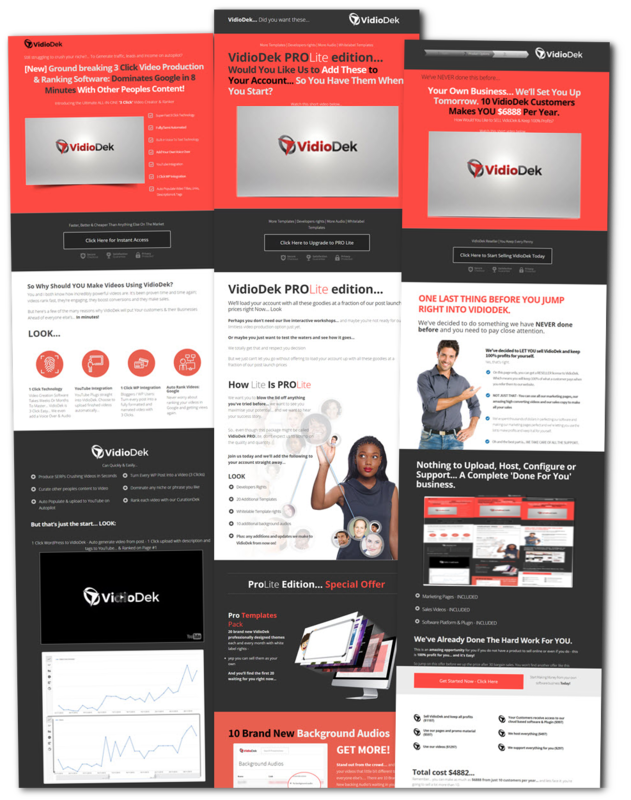 You won't find another offer like this anywhere; we have spent over $10,000 in creating this software and marketing funnel... and we're giving you the unique opportunity to make a LOT of money from this unique tool. Remember... you can make as much as $6888 from just 10 customers per year... and lets face it: you're going to sell a lot more than 10. But: Right Now we'er giving the next 30 customers the opportunity to grab a whole 1 years reseller license for just $197. You can sell everything in out marketing funnel (even the reseller pack) and keep every penny... How many do you think you could sell in a month or a year?